Fotospeed SB50 Odourless Stop Bath is a low odour, citric acid stop bath. After development, we recommend that you rinse films and papers in an acid stop bath. This will stop development immediately. A stop bath will also neutralise the developer to help maintain the activity of the fixer bath. 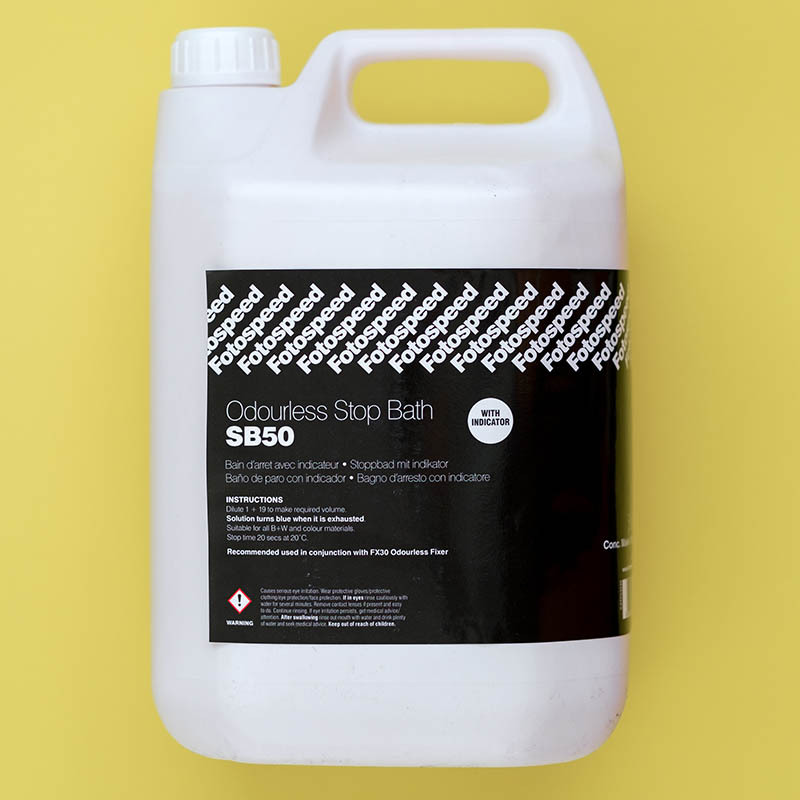 Fotospeed SB50 Odourless Stop Bath 5L is a low odour, citric acid stop bath. After development, we recommend that you rinse films and papers in an acid stop bath. This will stop development immediately. A stop bath will also neutralise the developer to help maintain the activity of the fixer bath. A stop bath will literally stop the action of a developer, by neutralizing any of its chemical still present. It will also help to maintain the activity of the fixer solution. While some people are happy not to use a stop bath. It will help prolong the life of your fix. The reason is, it will reduce carryover of excess developer into the fixer bath. By using a stop bath, your chemicals will last longer. Helping you save money and reduce waste. Fotospeed SB50 also has an indicator dye to warn you when it is exhausted. To prepare your stop bath, dilute Fotospeed SB50 Odourless Stop Bath 5L 1+19. That means one part stop to nineteen parts water. The dilution is the same for both paper and film processing. Make sure you mix together thoroughly before use.